Ideal for educational and routine laboratory use for biology, geology and industry, the Eclipse E200-Pol incorporates Nikon’s acclaimed CFI60 infinity optical system to provide a high quality, compact and easy-to-use polarising microscope at a modest price. 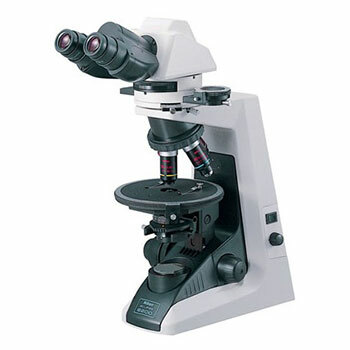 While designed for education and routine laboratory use, the Eclipse E200-Pol shares objectives and accessories created for the higher-grade Eclipse series of microscopes, so enabling more advanced polarising microscopy techniques if desired. Thoughtfully designed to get the most from polarising observations, the Eclipse E200-Pol is equipped with a precise, centrable stage that features a vernier scale capable of reading to 0.1°. The microscope also incorporates an intermediate tube with Bertrand lens to allow the observation of conoscopic images – ideal for uniaxial or biaxial crystal identification and for the evaluation of other optical qualities.